Beaming with grandeur, this floor plan exhibits exceptional architectural detail in its fascinating exterior. The multiple gables and large dormer grant height, while elegant windows spark instant curb appeal. For added luxury, the large master suite features a lengthy walk-in closet and stylish tray ceiling. A built-in shower seat and linen closet add flair to the master bath. Adjacent to the master bedroom, the dining room is also accented with a ceiling treatment that grants altitude to the formal room. For entertaining or just enjoying family time, the vaulted great room includes a fireplace and built-in shelves for family knickknacks. Accessing the rear porch and overlooking the front, the great room provides double opportunities for enjoying Mother Nature. 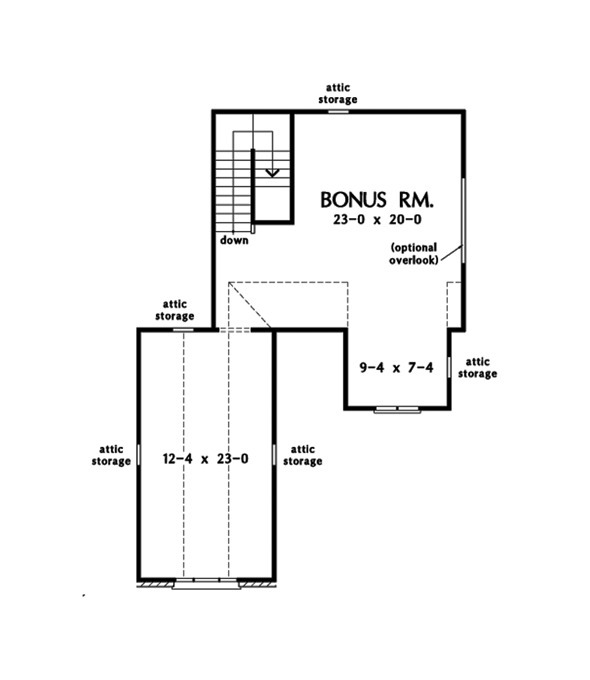 The bonus room offers 866 sq. ft of additional flexible space. 1st Floor: 1835 Sq. Ft. Bonus Room: 866 Sq. Ft.
House Dimensions: 54' 3" x 57' 10"
Great Room: 17' 0" x 20' 0"
Dining Room (Cathedral): 12' 0" x 13' 0" x 15' 8"
Great Room (Vaulted): 17' 0" x 20' 0" x 20' 4"
Kitchen : 12' 0" x 10' 0" x 9' 0"
Bonus Room : 23' 0" x 20' 0" x 9' 0"
Master Bedroom (Tray): 16' 4" x 13' 0" x 10' 6"
Porch - Front : 17' 4" x 7' 0" x 10' 3"
Porch - Rear : 11' 8" x 12' 11" x 9' 7"
Storage (Other) (Sloped): 3' 4" x 4' 10" x 0' 0"
Other : 12' 4" x 12' 23" x 0' 0"